These innovative creations are making waves in eateries across the island. Are they in your menu? Bowls are one-dish meals packed with protein, carbs and veggies, and are often seen as a quick, fuss-free solution for busy diners who are pressed for time. They’ve long been used as a convenient option for breakfast and dessert, but its renewed popularity has made it such that bowls are claiming lunch and dinner too. Part of the bowl’s appeal is the ability to fill it with lean protein, grains, vegetables, and everything synonymous with healthy eating, and its ability to let you savour all these flavours and textures with every bite. They are a staple among those who want to stay healthy, and protein bowls, Buddha bowls as well as quinoa bowls are all popular choices. The key to appealing to diners who love bowls is to offer variety and flexibility. Provide diners with a large selection of vegetables, whole grains and proteins to pique their interest. Other popular ingredients include quinoa, brown rice and soba noodles. You can also add cheese, nuts, lean meats (chicken and turkey), tofu and tempeh. Another way to make the bowl more enticing is through its visual appeal. Include red cabbage, seaweed, shredded beets, carrot, rocket or kale to add colour. Also throw in some nuts, seeds, pulses, sprouts and shoots. In terms of texture, think avocado, pickled ginger, tomato, apple and cucumber. Breakfast bowls are becoming increasingly popular as a healthy alternative to smoothies. They’re rich in antioxidants and high in energy levels, making them a perfect way to start the day. Look at including fruit and grains in your bowls, and finish them off with a good helping of natural yoghurt. Popular fruit choices are kiwi, blueberries, strawberries, mango, and bananas. Other ingredients to consider are chia seeds, coconut flakes and granola. Porridge has also re-emerged as a fashionable breakfast option, except that now, it is served as the base of a morning bowl. Oats can also be soaked overnight with fruit, nuts and maple syrup. Power bowls are gaining traction in restaurants and upscale chain stores around the world. These little charmers typically comprise of brown rice, vegetables, legumes, lean meats, grains and other forms of protein. Aesthetics are key when deciding how to present your food in these bowls. Such bowls are very Instagram-friendly among the younger crowd, and the combination of colours and ingredients makes the bowl that much more photogenic. A simple but very effective way to add some zest to your bowls is with a variety of dressings. 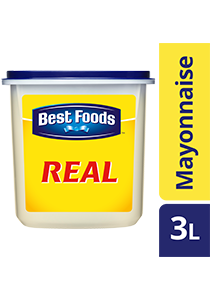 One of the most popular bowl dressings used by chefs is Best Foods Real Mayonnaise that complements your ingredients with its creamy smooth texture and light but flavourful taste. For even more excitement, you can try combining dressings for a fusion of flavours. Popular choices include Best Foods Mayonnaise Baguette and Lady's choice Mayonnaise Burger dressings. For a local twist, you can consider adding sambal to Thousand Island dressing for a sweet and tangy flavour. If you’re feeling adventurous, try adding peanut butter to honey mustard dressing for a nutty taste. Will you add the bowl to your menu? With so many ways to make these bowls both delicious and unique, you might want to try making them a permanent fixture on your menu. Who knows, your restaurant might just develop its own group of bowl fans!